Semi-double; large. Three to four rows of large, pink guard petals surround a band of smaller inner petals, which grade smaller inward to a remnant of stamens and centered by a pair of red tipped carpels. The color is most saturated in the depths of the flower and lightens outward to tips of the rounded guard petals. One flower per stem is presented a few inches above the strong bush on sturdy, erect stems of medium height and clothed in yellow green foliage. 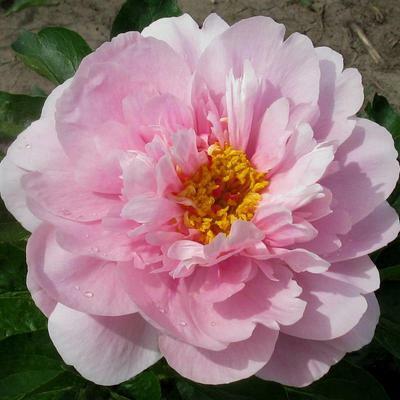 Leaflets remain green well into summer, being somewhat resistant to leaf spot fungi and quite resistant to peony mildew. The plant is a strong grower in our Midwest climate. The name honors Don Hollingsworth granddaughter, Elizabeth. Herbaceous Hybrid. Parentage: 'Sugar 'n Spice' x 'Pink Vanguard'. This new cultivar is promising as a breeder plant, being both pollen and seed fertile, carrying the multipetally and progressive transformation of stamens traits, both being a part of the complex genome which enables the widely sought full Double flower form in peonies.